Most people know how to create a monthly budget, pay off debt and meet a savings goal. But few bring these individual components together into a holistic and long-term financial plan. They think they’re making the right decisions, but they don’t really know how financially secure their family is. Or worse, they outsource the responsibility to a financial adviser and feel relieved that an “expert” is in charge. 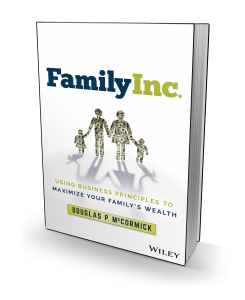 In FAMILY INC., Douglas P. McCormick empowers readers to take control of their family’s financial security with the confidence and strategic insight of a corporate Chief Financial Officer. The book teaches readers how to become the CFO of their family, apply the time-tested principles of corporate finance to the family’s finances, and plan, monitor, and forecast their family’s financial future. Douglas P. McCormick, bestselling author of Family Inc.